I’ve recently returned from a fantastic week in San Francisco at Google’s Cloud Next ’19 conference, which is their annual Cloud conference for developers and vendors. It’s a huge event, with some 30,000+ attendees and 500 sessions. Google made a 122 announcements, including some exciting developments relating to Google Sheets. If you only watch one session from next and you’re a Google Sheets user, then I’d recommend this one. It’s really well presented look at the capabilities of Google Sheets in the context of working with data and the Sheets team give plenty of sneak peeks into where the tool is going. Connected sheets: easily connect Sheets to BigQuery and use Sheets functionality, like pivot tables, formulas and charts, with millions or even billions of rows of data inside BigQuery. The presenters showed an incredible demonstration of running a pivot table on 128 million rows of data! Most of us use spreadsheets beyond simple data tasks. We build to-do lists, address books, scheduling apps, bug trackers, etc. Eventually, however, there comes a time when you need something more robust than a standalone Google Sheet, and this talk explores that journey, from single Google Sheet to full-blown application. An interesting session looking at how AAA uses BigQuery and Machine Learning to create predictive models that everyone can access through the Google Sheets interface. It was fascinating to see how Google Sheets has been positioned as the final step of the big data/machine learning pipelines. The full library of sessions from Google Next 19 can be found over on the Google Cloud Platform and the G Suite channels. See you at Google Next 20 perhaps? Text Rotation in Google Sheets allows you to angle the text up or down inside your cells, which lets you create some nifty looking headers. How do I make a diagonal line to split a cell, so that I can enter text into two triangular subdivisions? You can’t split a cell explicitly, but you can use text rotation and formula-trickery to achieve this effect. 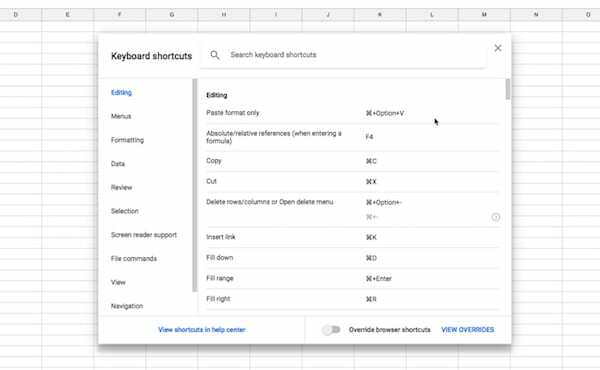 Use keyboard shortcuts to work more efficiently. It might feel clumsy at first, but persevere and it’ll pay off in spades as you become more efficient in your work. Have you ever needed to use Vlookup with multiple criteria? For example, you may want to use first name and last name combined to search for a value using Vlookup. In this post, you’ll see how to Vlookup multiple criteria in Google Sheets, with three different scenarios. Disclosure: Some of the links in this post are affiliate links, meaning I’ll get a small commission (at no extra cost to you) if you signup. In this post, you’ll see how to remove duplicates in Google Sheets using Add-Ons, Formulas, Pivot Tables, Conditional Formatting or Apps Script. Firstly though, what are duplicates? And why are they a problem?